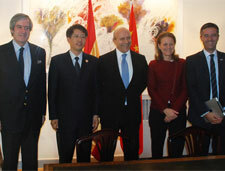 Ten years after the creation of the CSMC (the Tianjin Spanish-Chinese Vocational Training Institution) as a joint project between AFZ (the Tianjin Vocational Training Centre) and AFM (the Spanish Association of Machine Tool, Accessory, Component and Tool Manufacturers), with collaboration from the Spanish Government, the contract to extend the collaboration agreement between AFM Advanced Manufacturing Technologies and AFZ was signed in the Spanish Embassy in Beijing this Saturday, 2 November. The event was chaired by the Minister for Education, Culture and Sport, José Ignacio Wert. The agreement will provide continuity for the CSMC, which trains young Chinese workers in Spanish technology and machines at a centre fully equipped with Spanish training equipment and technology. The first year of certifiable training will also get underway this week, on Tuesday 5 November, in collaboration with the IMH and the CSMC. The Tianjin Spanish-Chinese Institute for Vocational Training in Machine Tools (CSMC) was officially opened in November 2003 and is an excellent platform for companies interested in conducting business in China, particularly in the Beijing-Tianjin region, one of the country’s main industrial areas. Tianjin is also one of China’s four main provincial administrative cities, together with Beijing, Shanghai and Chongquing. In April 2011 the CSMC moved to new facilities in Tianjin, twice as large as its original headquarters. At the CSMC, AFM Advanced Manufacturing Technologies offers a Services and Welcome Centre for industrial firms wishing to undertake business, purchasing or production activity of any kind in China. The Elgoibar Machine Tool Institute (IMH) is a benchmark centre in Spain in the area of vocational training for the machine tool sector. Co-founded in 1991 by AFM, along with its partners and different institutions, it actively collaborates with the association and its companies in the highly qualified training and skills area. Since October 2012, it has also been the base for the IMH University College, which offers Spain’s first Dual Engineering Degree course. Mr. Wert travelled to China to preside the official opening of the Beijing Education Exhibition, where Spain is the guest Country of Honour this year. During his stay in China’s capital, the Minister held meetings with the Chinese Ministers of Education (Yuan Guiren) and Culture (Cai Wu), among other activities.